A very nice person from a climate far colder than ours gifted us this cute dwarf Restio. And I have to say it has performed wonderfully in my garden. It froze to the ground at 9ºF- but returned in spring right away. Seems to be one of the hardiest and easiest to grow that we have encountered. Really shines in containers where you can see the sheaths on the blue green segmented stems. 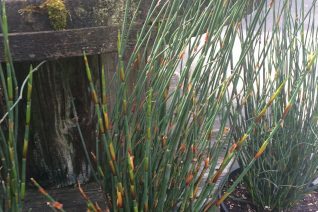 Rises to about 20″ tall with many stems. In summer they are topped by clustered brown flower structures. Very nice. Well drained somewhat enriched soil (for a Restio thats odd). Full sun to very light shade. Grows fairly quickly given the conditions stated above. Light summer water. Protect containerized plants from temperatures below about 20ºF. Evergreen most winters including the bummer winter of 16/17. We’ll make as much as we possibly can. South Africa. A striking perennial that immediately recalls a rush, though it has very different requirements. 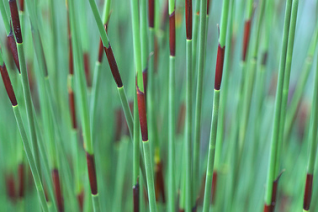 Thin vertical stems are slightly swollen at the base and have a slight zig-zag as they rise. Sage green year round this is one of the cold hardiest Restios. Eventually reaching 30” tall it forms a tidy and tight clump eventually to 1’ wide. Full sun and well drained soil with average water needs. Excellent container subject. Evergreen.